Solutions for the implementation of acoustic quality in urban areas and buildings have been proposed in different ways. 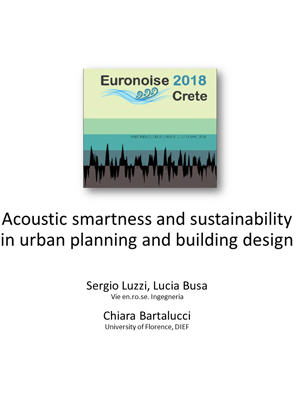 In the frame of circular economy, smart and sustainable actions involving acoustics have been implemented, not only privileging sustainable acoustic materials but also applying new approaches like holistic and multisensory design of living spaces, temporal design and global comfort, connected with acoustics and noise protection. Users opinion have been taken in account as well, in terms of noise awareness a participatory design. In this paper, starting from an overview of the most diffused methods for noise control and acoustic quality design of outdoor and built environment, a special evidence is given to approaches that consider smartness and sustainability, as derived by the experience of the authors.